Parents United for Public Education fully supports the lawsuit filed today in Commonwealth Court challenging Pennsylvania’s system for financing public education. We applaud the individual students, families, and organizational plaintiffs who have stepped forward to take necessary action against a state that has violated its own constitutional guarantee of a “thorough and efficient” system of public education for all children. The plaintiffs in the suit assert what parents across Pennsylvania have known for years: that our state has willfully, consistently, and pervasively underfunded our public schools to levels of deprivation that shock the conscience and demand remedy from the courts. Pennsylvania’s state contribution to local school district budgets is well below national norms. While the national average state contribution to district budgets is 44%, Pennsylvania’s contribution is only 34%. Only nine states nationwide contribute a smaller average percentage to school district budgets. Furthermore, as one of only three states across the nation without a fair funding formula, Pennsylvania’s allocation of its funds favors the politically connected and compounds inequities among districts. The Education Law Center has found that low-income public schools spend $3,000 less per student than their wealthier counterparts, amounting to $75,000 less per 25-student classroom, yet low-income districts contain many more students likely to have higher needs due to poverty, English Language Learner status, or disability. 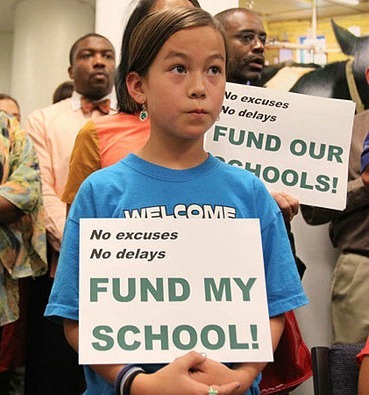 Not only have poorer districts borne the brunt of the state’s arbitrary cuts but, as newly released research makes clear, districts with high percentages of white students receive more funding than districts at similar income levels but with more racially diverse populations. No matter the intent, the result of the state’s refusal to fund responsibly has been an allocation system that is effectively racist. The consequences for children have been enormous. Last year, Parents United for Public Education and the Public Interest Law Center of Philadelphia collected and filed 825 formal complaints against the state department of education detailing shocking educational deficiencies that we believe violated the Pennsylvania State Code. As we witness our children’s schools deprived of essential supplies, required personnel, an adequate numbers of qualified teachers, the required range of courses, and basic facilities maintenance, we can see how Pennsylvania proves every day the destructiveness of its current approach to school funding. Furthermore, Pennsylvania has modified existing educational standards and adopted new ones recently, which it defines as measuring student educational success, but it has not provided the resources necessary to implement and achieve them. Over the past several years of budget cuts, standardized test results chart an unprecedented scope of decline in every tested area and for every grade. Students across the state are not meeting these new standards because the state has not adequately supported them. For these reasons and many more, Parents United gives our wholehearted support to this lawsuit, and we urge the Commonwealth Court to take swift action in finding for the plaintiffs and righting these unconstitutional, and unconscionable, wrongs. Read more about the District’s budget struggle.